This is a list of the Democratic Senate candidates running in the 2014 Election, with links to their Facebook and Twitter profiles. Social media is a great way to communicate concerns to representatives. Once that ballot is in the mail send your candidate a Tweet or message on Facebook to let them know they are getting your vote from abroad. Then keep reminding them during their next six years in office. We are neighbors here in Switzerland sharing a nationality and concerns of expats, but we do not share representation. Since Americans abroad vote for Congressmen and women who work for our home state, as a constituency U.S. non-residents seem too spread out to have an impact. But Social Media can help amplify our needs. 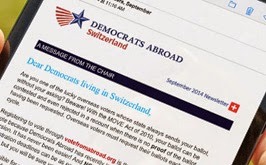 Use hashtags #DemsAbroad and/or #VotefromAbroad with Twitter so your representatives will know you are a voting non-resident. With millions of Americans living abroad, we can make an impact when we unite.